Interview with Ron Ellis conducted March 2010. In 1966, at the young age of 14, Ron Ellis was a student by day and a rock and roller by night. "I was in different groups around town," he said. "I was in one called The Tangerine Dream, but later we found there was already a band called that. We thought it as original. We were playing Rolling Stones songs, primarily." But the Pueblo teen guitarist's career took a different turn when his parents divorced, and he moved to California with his mother. Soon after they arrived, a tragic car accident took the life of his mother. Ron found himself back in Colorado. He enrolled at Pueblo East High School. Around this time Ron, and his older brother Joe, picked up where they left off, and started playing around town. When they didn't have a gig, they would catch one of their favorite groups, the Trolls. "We always thought if we could get one of the Trolls in our group that would be incredible - those guys were like the Rolling Stones in Pueblo," he said. "They were huge." Taking their cue from bands such as the Rolling Stones, and the Kinks, the Trolls blend of British rock gave them local superstar status. 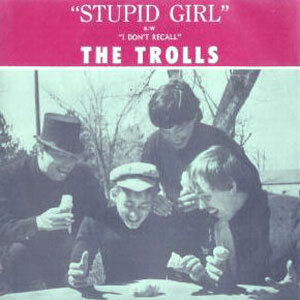 Led by singer/guitarist Richard "Speedy" Gonzales, organist Fred Brescher, drummer Phil Head, bassist Monty Baker and lead guitarist Doug Rymerson, the Trolls issued a couple of 45s ("That's the Way My Love Is" / "Into My Arms" Ruff 1010 - 1965 and "Stupid Girl" / "I Don't Recall" Warrior 173- 1966). After attempting to make it big in California, the group disbanded in 1967. After the band broke-up, Richard Gonzales put away his guitar, stayed on the West Coast, settled in to married life...and a regular paycheck. "We had met Speedy's brother Leroy, who played drums. He said 'I know my brother will want to play with us,' so we went to California to ask him to be in our band," Ellis said. "Speedy’s wife wasn’t happy that he wanted to be in another group, and he was reluctant. He had a nine-to-five job and had given up the whole music thing." 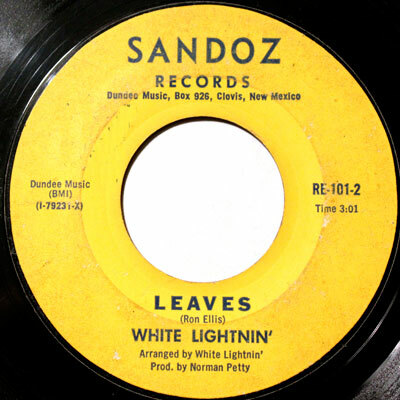 With the line-up complete, the foursome of the Ellis and Gonzales brothers moved back to Colorado, and under the guidance of local manager Tony Spicola, quickly made a local name for themselves as White Lightnin'. "Speedy named the band," Ron Ellis said. "We were just kidding around and then we found out there were a number of bands named that." A local nightclub owner, as well as media and public relations mogul, Tony Spicola saw potential with the group. He knew the next step was to get them in the recording studio. "He thought it would be good for his club attendance if we had a record to sell." In 1969, just after Ron Ellis graduated from East High School, Spicola booked Norman Petty Studios, in Clovis, NM. "I kinda knew who Norman Petty was," said Ellis. "We walked into to the studio, it was a great studio. He bought an old movie theatre and you would record on the stage. In the projection booth was the recording equipment." After playing several songs for Petty, the producer decided on two for the band's single - "Leaves" and "Blue Man (Peace of Mind)." Listen to "Blue Man (Peace of Mind)"
"When we were out in California, we were doing some gigs, but the guy at the club wouldn't pay us," said Ellis. "There was a person who lived nearby and said if we rolled 200 "whites" for him in tin foil he would give us 50-bucks. Leroy and I jumped in and started doing it. When we left the guy said 'Take as many as you want,' and I took some of them. After we left his house the police stopped us and took us in – those were the blue men. We were put in a room and interrogated. They called home in Colorado and then released us." "Leaves is a very personal song for me," Ellis said. "When my parents divorced and I moved to California with my mother, she was involved in a head-on collision, and died. I have a recollection of that being in the autumn. I looked around at the leaves dying and just wrote it–there aren't a lot of lyrics, it's mostly feeling. While recording "Leaves," Norman Petty added strings to the arrangement. "We listened back and really didn’t envision that as part of the song - so we took it out." After a successful recording session, the band headed back to Colorado - but Tony Spicola had other ideas for Ron Ellis. "We took separate cars. I rode with Tony," Ellis said. "He showed me a contract, and told me that he wanted to work with me as a solo artist. I told him that I wasn't interested because my brother was in the band. It was kinda funny, Tony christened me with this name, I don't remember what it was, but that was going to be my new stage name." Released in January 1970, on the band's own Sandoz label (Speedy Gonzales named the label after Eric Burdon's "A Girl Named Sandoz"), the record received extensive airplay throughout Colorado. "We also played a lot of gigs," Ellis said. "But then Leroy started acting weird, and it was pretty embarrassing. He would play drum solos with his head - and we knew it was time to end the band." For Ron Ellis' second act, he decided to go back to school. "I thought it would be a good idea for me to learn music," so I started taking classes at USC [University of Southern Colorado]," he said. "Joe and I went on to form The Ellis Brothers, and then we got together with [former Trolls member] Phil Head and formed Waco." After Waco, Ellis found success in The Cows. "That was a fun group because for once I didn’t have to carry the show," he said. "We were kinda like Alice Cooper on fire - real crazy. We were playing Mothers of Invention type stuff. We played in the Springs and the mountain towns - but we only did that for about six months." 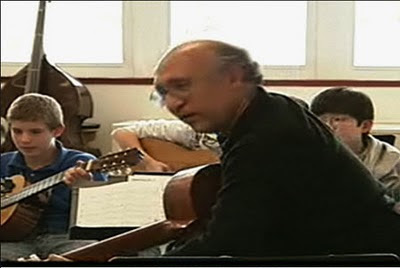 Ellis graduated from USC, and was offered a job there teaching classical guitar. "My brother thought I snubbed the whole rock world," he said. He would go on to write a ballet, entitled Repetition, which would be performed at the local Sangre De Cristo Art Center. Moving to Albuquerque to pursue his master's degree in music, he came back to Colorado, and is currently teaching music at a Colorado Springs middle school. Joe Ellis moved back to California, and plays bass for the group Blues Highway. Attempts to contact Richard Gonzales were unsuccessful. Numerous sources indicated that Leroy Gonzales passed away, but this is unconfirmed. "For me, Eric Clapton and all of those guys entrenched themselves in that rock lifestyle, but I really didn't feel that it was part of what I should be doing," Ellis said. "I came out of it pretty unscathed." Interview with Ida Mae Mickey, Marcella Mickey, Jean Hasty and Eugene Birt conducted March 2010. Bob Mickey's parents came to the La Junta area in 1916, where they homesteaded south of town. Moving into La Junta proper in 1921 he was born two years later, in a family who as spent as much time in church as they did working the farm. But Bob Mickey had other ideas. "He never wanted to settle down," said his sister Jean Hasty. "He followed his older brother to California, and worked at the Swift packing plant, and didn't like it, so he started driving a taxi, and then one day he took his guitar to a bar, and started playing." Throughout the 1940s, Mickey would find himself in every honky tonk on the West Coast, playing for tips. After introducing himself to Tennessee Ernie Ford, he would go on to appear on the star's radio show, and pitch a song to the singer that he a recently written. The song was called "All I Want for Christmas," said Hasty. "Ford went on to record it, and for the longest time Bob would get these little residual checks from that record." For the next decade, Mickey kept busy working the bar circuit, but a trip back home to Colorado in 1953, before a booking in Santa Fe, would forever change his life. "My mother invited him to go to church," said Hasty. "During the service he became converted. He called the bar in Santa Fe and told them that his life and priorities had changed, and he wasn't going to make the show." Almost immediately the western-attired preacher became an in-demand evangelist, sharing his testimony at revivals. The nightclub audience he once played to for tips was replaced with packed believers who wanted to hear how this former honky-tonker found the Lord. In 1954, friends attempted to set him up with Esther Mae Roberts - but he had his eyes on her cousin, 24-year-old Ida Mae, a Lamar chalk artist who often used her artistic talents to portray Bible scenes during church services. "My parents were good Christians, and they knew that God forgives you, so they didn't have any problems with him and his past life," Ida Mae said. The two married February 14, 1955. "Bob was working with an evangelist and taking a correspondence course to become a preacher," Ida Mae said. "We went on a short honeymoon, and then started doing revivals together." Bob and Ida Mae would live out of a suitcase the first few months of their revival career, staying in church Sunday school rooms, or in a pastor's home. Realizing they needed to expand their living conditions, with the arrival of their daughter Marcella (in 1959), they purchased a trailer. Coming back to Lamar for the birth of their daughter, the Mickey family went back on the revival circuit just three weeks after she was born. 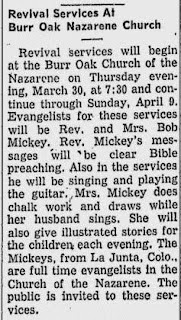 After ten years on the road, in 1969, the Mickeys came back to Lamar, in part so Marcella could attend elementary school. They continued to travel during the summer. By 1975 the family again hit the road full-time, home schooling their daughter, who would go on to become a licensed practical nurse. 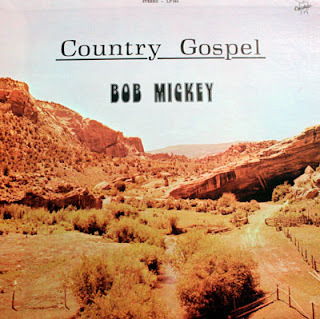 While touring California, Mickey recorded Country Gospel (Crusade 584). 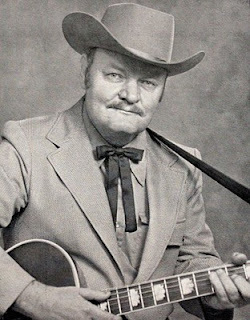 Released in 1974, the album contains numerous religious standards, a cover of Hank Williams' "I Saw The Light," and one Bob Mickey original composition, "It's Later Than You Think." Listen to "It's Later Than You Think"
"The picture on the album cover was chosen because my grandfather had homesteaded south of La Junta and the cedar breaks on the front cover look like their homestead site," said Mickey's daughter, Marcella. In 1991, after nearly four decades on and off the road, Bob Mickey returned to the Lamar area, where he pastored in and around southeastern Colorado, including the Holly Nazarene Church. "He was a very good pastor," said current pastor Eugene Birt. "You never saw him without his cowboy hat on - except in the church building." In 2001 Mickey was planning a trip to Seattle to celebrate his sister's 66th wedding anniversary, when his health began to decline from years of diabetes and heart failure. Just three days before he was to leave, he died. He is buried in Lamar.